In the spirit of adding an innovative element to a traditional custom, something we always love doing at Ananya, we wanted to share some easy to make recipes you may want to try for any occasion including Ramadan. These recipes come from culinary expert Anjali Pathak, of the famous Indian food company Patak’s, whose brand of curry pastes and sauces has been a household name since 1957. The holy month of Ramadan is with us. A whole month of fasting from dawn till sunset will commence, and at sunset each day, the fast will be broken with an ‘Iftar’ a meal shared with the family and often the community, with a sense of celebration. 1. In a pestle and mortar bash the cloves and green cardamom pods to release the flavours. 2. In a pan gently heat the honey with the cloves, green cardamom and cinnamon for a few minutes. 3. In the meantime prepare the figs. Cut the figs into quarters from the top to the base without cutting all the way through. Pinch the bottoms slightly so the flesh is exposed. 4. Pour the aromatic honey over the figs making sure there is plenty in the centre of each one. Bake in a preheated over 180°C/350°F/gas 4 for 12-15 minutes or until they are softened. Discard the whole spices before serving if you prefer. 5. In a small bowl soak the saffron with a teaspoom of warm water and stir to release its wonderful colour and aroma. 6. In another bowl mix together the yoghurt, sugar, saffron including the water, and mint. Taste and add more sugar if desired. 7. 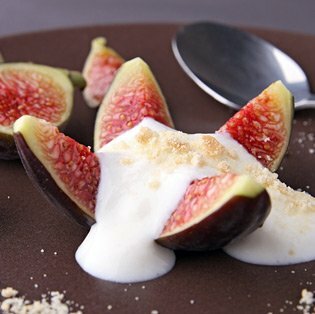 Serve the figs with a good spoonful of saffron scented yoghurt. Simply delicious! 2. Cut the aubergine slices in a criss-cross pattern on one side. Lay them on a greased baking tray. 3. Drizzle over most of the olive oil and sprinkle over the turmeric powder, caraway seeds and black pepper. 4. Sprinkle over some sea salt. 5. Slit the chilli down the middle and carefully remove the seeds, or you can leave them in if you like your dishes hot. 6. In the corner of the baking tray put the chilli and garlic cloves and drizzle over the rest of the olive oil. 7. Roast in the oven for 35-45 minutes until they are soft and golden brown. 8. Slice the roasted chilli and remove the skins of the roasted garlic. 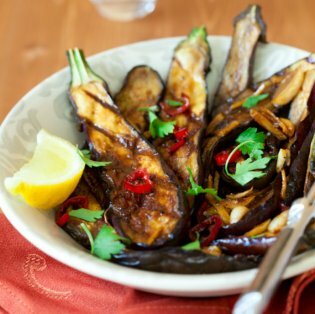 Sprinkle over the aubergines with some fresh coriander and serve with a wedge of lemon. Anjali’s Tip I like to make a dip by mixing yoghurt with some stir fried onions to tone down the chilli heat. 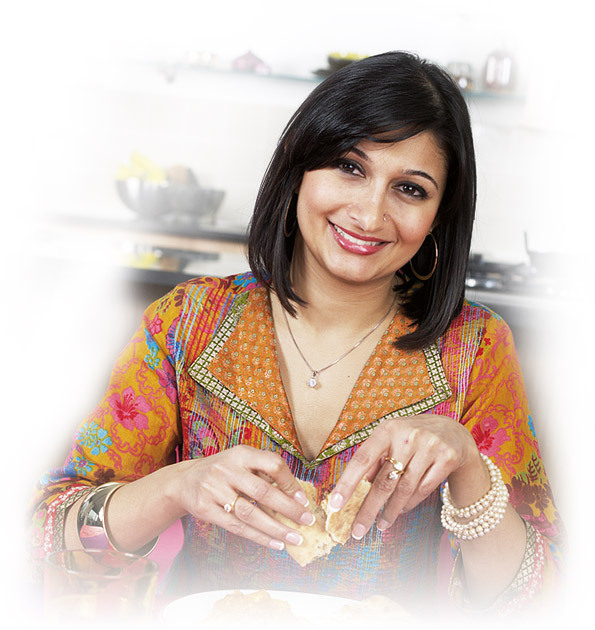 As well as being a member of Patak’s Indian food dynasty, Anjali is an Indian food connoisseur in her own right. She is a chef and a food writer who loves experimenting with traditional Indian and contemporary International cuisine. Please visit her website for lots of wonderful recipes and inspiration. What are some of your favourite dishes for Iftar? Do you experiment with new recipes? We’d love you to share them with us.